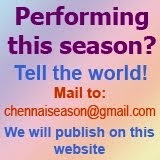 The oldest sabha in Chennai hosts a rather long festival during December. The festival will be inaugurated on Dec. 14, 2016. Morning lec-dems and concerts upto 2 p.m. are open to all. Evening concerts are ticketed. Daily donor passes are priced at Rs. 500, Rs.200 and Rs. 100. 5.30 p.m. - His Holiness Sri Sri Yathiraja Jeeyar Swamy, Sri Yathiraja Mutt, Melukote inaugurates and confers the Awards 'Sangeetha Kalasarathy' on Papanasam Sri. Ashok Ramani, ‘Acharya Kalasarathy’ on Smt. Suguna Varadachari. 8.30 a.m. - Lect. Demo. How to Bridge the Gap between Learning and Performance - Interactive Session - Vid. Sudha Ragunathan Interacts with Vid. Aishwarya Vidya Raghunath, Vid. Anahita & Apoorva Ravindran, Dr. Sudha Raja’s Sargam Choir Students. 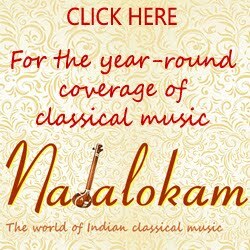 Watch Parivadini's concerts live online!